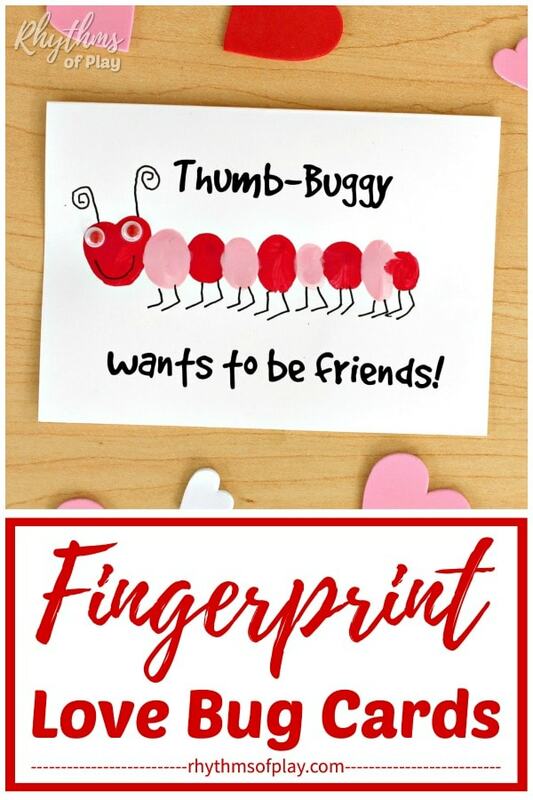 This collection of thumb-buggy fingerprint love bug card ideas is perfect for Valentine’s Day! 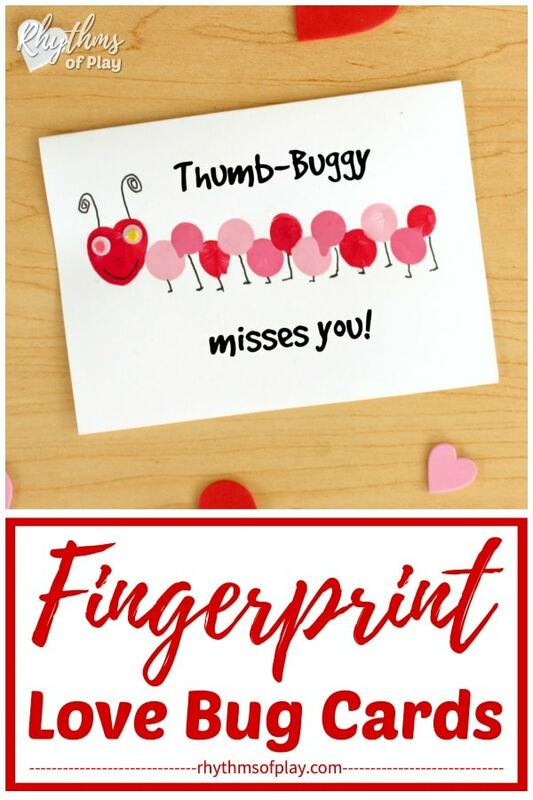 Fingerprint love bugs also make great card ideas for Mother’s day and lots of other occasions such as missing you cards and anniversaries. This thumbprint love bug craft not just for kids, make some love bug fingerprint art for someone you love today! 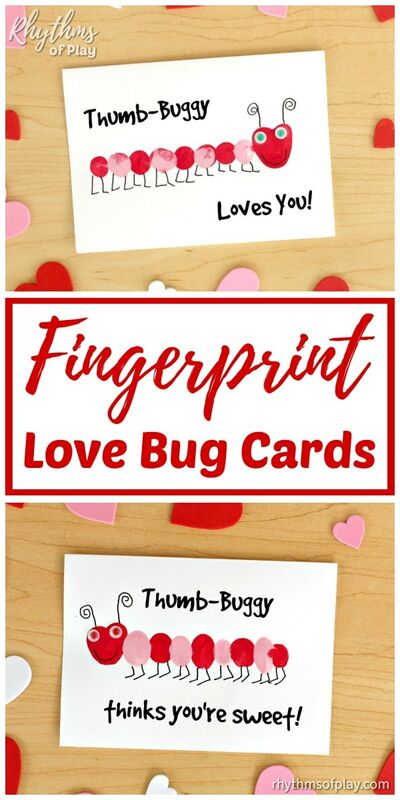 Use your fingers and thumbs to make homemade fingerprint love bugs for love bug cards. Thumbprint heart love bug cards are fun to make for Valentine’s day and lots of other occasions. 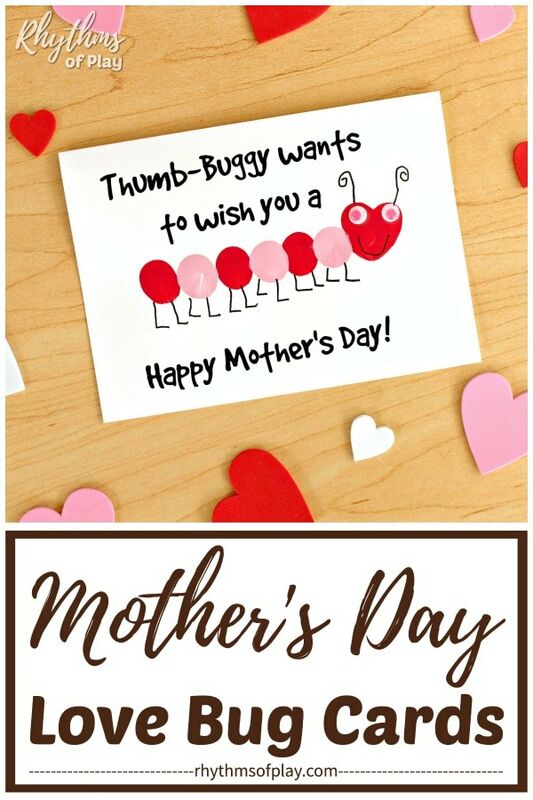 If you don’t feel comfortable giving someone a card that reads, “Thumb-Buggy loves you,” write “Thumb-Buggy thinks you’re sweet” instead! Or, try any of the other love bug card message ideas below!! 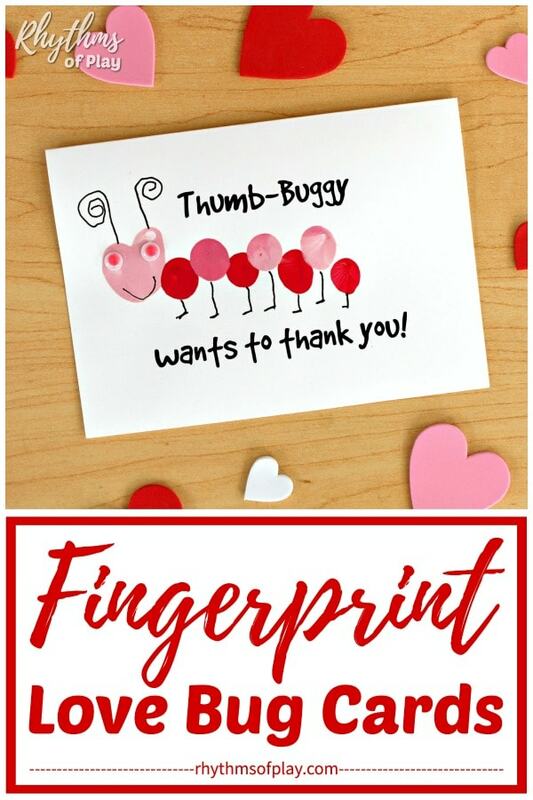 We have provided lots of “Thumb-Buggy” love bug card messages that you can use on your handmade fingerprint art cards for different holidays and events. Just follow the step by step fingerprint love bug card tutorial below. 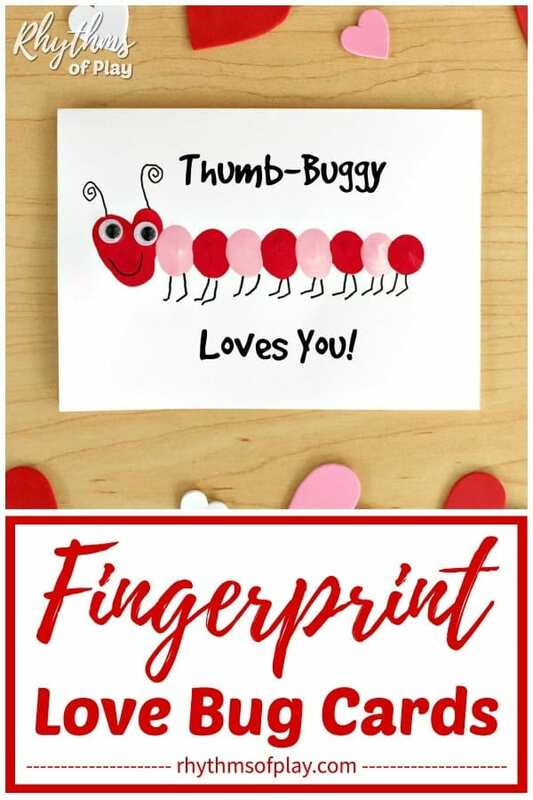 Thumbprint love bugs are not just for kids, make some love bug fingerprint art for someone you love today! Mix red with white tempera paint to create at least one shade of pink. Make a lighter and darker shade for even more fun! Add more white than red to make a lighter shade pink and more red or less white to make a darker shade of pink. Another option is to buy tempera paint with several colors (including shades of pink) pre-mixed. Start your love bug with a thumbprint heart for the head of your fingerprint love bug. First, use your thumb to make a thumbprint heart on the left or right side of the front of a blank greeting card. Children that have not, or, are still learning to read and write, should only make heart love bugs that go from left to right in order to prepare them for reading and writing. In Montessori education, children complete all actions from left to right to create the habit of going from left to right in order to make learning to read and write a little easier. This is why all Montessori learning activities for young children are completed from left to right. Press thumb into tempera paint. Gently press thumb with paint onto the paper. Press thumb into tempera paint to reapply paint if needed. Next, dip your fingers into the red and pink tempera paint to make the rest of the thumbprint heart fingerprint love bug to finish the thumb-buggy. Use a different fingertip for each tempura paint color. Feel free alternate red with pink to create your fingerprint love bugs, or make them all the same color. Just be careful not to mix up your fingers as you dot your love bug cards… but mixing and blending the colors can be fun too! Allow thumbprint heart love bugs to dry completely before moving on to the next step. Use white glue to attach googly eyes and fine tip paint pens to decorate your love bug fingerprint art. Draw a smiling face and cute little feet on your love bugs to bring them to life. Children love to make love bug art! Thumb-Buggy fingerprint cards are perfect for Valentine’s day and several other occasions. 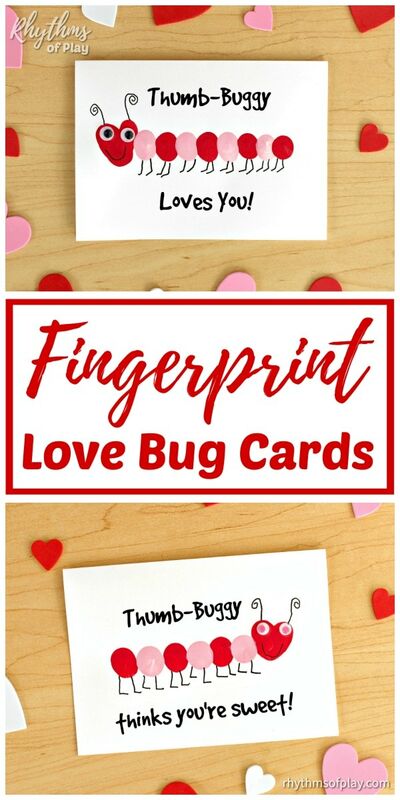 Check out all of the fingerprint card messages and phrases we have come up with below the fingerprint love bug video tutorial. There are so many fun ways to make a love bug card and a lot of card message ideas that you can choose from, depending on the occasion. 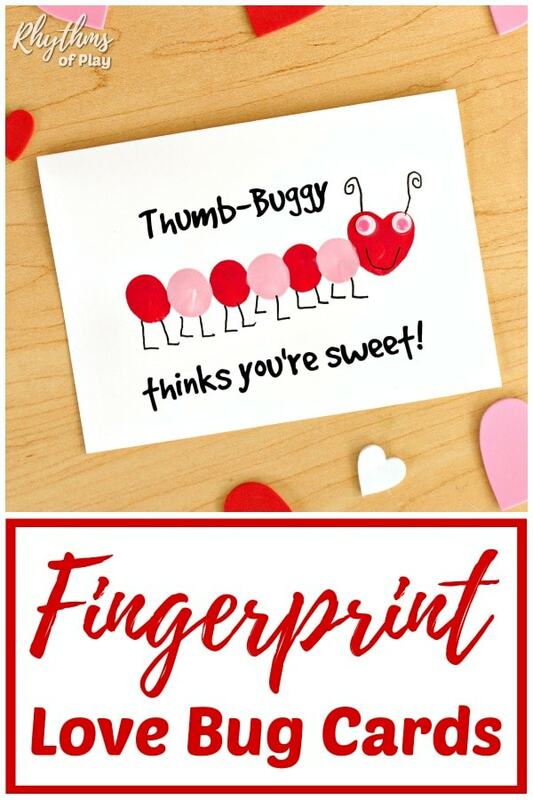 We have come up with lots of fun messages, sayings, and phrases to write on your love bug fingerprint cards for Valentine’s day, Mother’s day, Father’s day, and anniversaries. Feel free to write any of our original “Thumb-Buggy” card message ideas and phrases that we have listed below on your cards. Note: These love bug message ideas are protected under Copyright Laws and are for personal use only. Please do not use our ideas to sell or publish. We’ve seen too many people and companies steal our original ideas over the years without proper attribution or compensation. 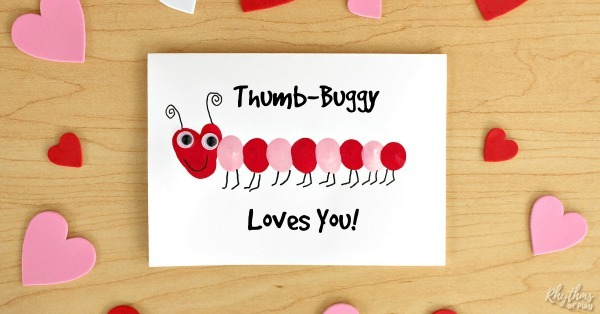 We have put a fun spin on the phrase Thumb-Body loves you… Write Thumb-Buggy loves you instead! Is there someone that you would like to be your friend? 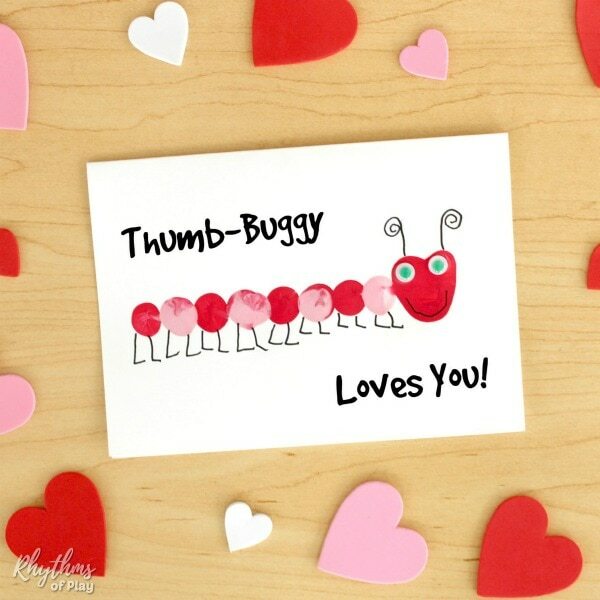 Give them a Thumb-Buggy wants to be friends Valentine’s day card! This is a great homemade love bug Valentine’s day card idea for kids to make and give to classmates and friends. Try any of the card message ideas below. Thumb-Buggy wants to be friends! Thumb-Buggy wants to be your friend! Thumb-Buggy wants a new friend. Thumb-Buggy wants to make friends. There is a whole slew of ways to write this one to make anyone feel special on Valentine’s day. Like Thumb-Buggy friendship cards, some of these ideas are also perfect for children to give to their friends or hand out at school. Thumb-Buggy thinks you’re kinda cute! Thumb-Buggy thinks you’re something special! Thumb-Buggy thinks you’re fun to be around! Thumb-Buggy thinks you’re the BEST! Are you looking for a kiss from your sweetheart? Try any of the “Thumb-Buggy wants a kiss love bug card message variations below. Thumb-Buggy wants to steal a kiss! Thumb-Buggy wants you to give him/her a kiss! Love Bug Miss You Card Idea: Thumb-Buggy Misses You! If you want to send a miss you card to someone you love, try writing any of the miss you love bug card message ideas below. Thumb-buggy can’t wait to see you! Thumb-Buggy is dreaming of the day we meet! There are lots of personalized ideas I’m sure you can come up with for mom. We have a few fingerprint Mother’s day card message ideas to share with you. If you are looking for gift ideas for mom, have a look at homemade gifts kids can make and gifts for mom that will put you in the GOOD Book! Thumb-Buggy wants to wish you a happy Mother’s day! Thumb-Buggy loves his or her mommy! Thumb-Buggy wants to thank you! Thumb-Buggy wants to say thank you. Thumb-Buggy is full of thanks. Thumb-Buggy is thankful for you. If you need to apologize to someone, a love bug card can help! Write any of the “I’m sorry” love bug message ideas below on your card to turn it into an “I’m sorry” card. Thumb-Buggy wants to say he/she is sorry. Thumb-Buggy needs to say I’m sorry. Lovebug cards are perfect for a wedding or an anniversary. Write “Thumb-Buggy wants to wish you a Happy Anniversary!” on your card to make your significant other fall in love all over again! There are lots of other ways to write an anniversary message on your cards. Get creative and personalize it in whatever way works for you! Make love bug cards for Valentine’s day or use any of the love bug card message ideas that we have provided above to create the best homemade love bug cards for different occasions and events all year! I think you can see from all of the amazing love bug card message ideas that we have provided, how many amazing ways you can use love bug cards to make someone’s day. You may also like to try fingerprint art magnets or this collection of fingerprint art ideas. Click the link to find a lot more ways to create art with your fingers and thumbs.